Three DEA agents and seven US soldiers were killed Monday when their helicopter crashed as they were returning from a firefight with suspected drug traffickers in western Afghanistan. 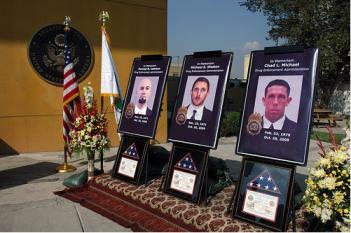 They were among 14 US casualties suffered in helicopter crashes Monday. An additional eight US soldiers were killed Tuesday, making October the bloodiest month for the US in Afghanistan since it invaded and occupied the country eight years ago. The DEA identified the dead agents as Forrest Leamon, 37; Chad Michael, 30; and Michael Weston, 37. 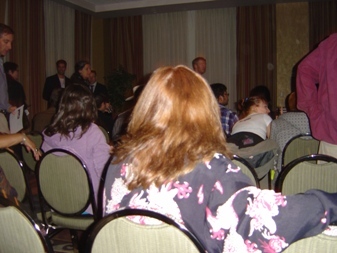 Leamon and Michael were members of the DEA's FAST (Foreign-deployed Advisory and Support Teams) and Weston was assigned to the DEA's Kabul country office. Their deaths were the first reported by the DEA since it initiated operations in Afghanistan in 2005 in a bid to thwart the country's multi-billion dollar opium trade. 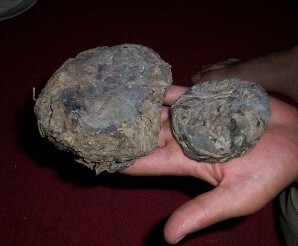 Afghanistan supplies more than 90% of the world's illicit opium, the raw ingredient for heroin. The UN Office on Drugs and Crime reported last week that Taliban insurgents earn as much as $160 million a year from taxing poppy farmers, protecting drug shipments, and operating their own drug smuggling networks. Those funds help finance Taliban operations against US and NATO forces and their allies in the Afghan armed forces. The helicopter crashed in the predawn hours Monday after returning from a raid in which US and Afghan soldiers attacked a suspected drug trafficking compound. The US military said a dozen insurgents were killed in the raid. The Taliban claimed credit for shooting down the chopper, but US officials denied that it had gone down because of enemy fire. The incident came as Afghan officials fiercely criticized a US military hit list of about 50 suspected drug traffickers, saying targeting them to be killed or captured "on the battlefield" undermines the Afghan justice system and could trigger a backlash against foreign troops. It was unclear if the compound attacked Sunday night belonged to a trafficker on the hit list. Anti-Western sentiment is already running high in Afghanistan. This weekend, police in Kabul clashed with anti-American rioters infuriated by rumors that American soldiers had burned a copy of the Koran. Several people were wounded when police opened fire on the angry crowd. The UN Office on Drugs and Crime (UNODC) warned Wednesday that the traffic in Afghan opiates is spreading drug use and addiction along smuggling routes, spreading diseases, and funding insurgencies. The warning came in a new report, Addiction, Crime, and Insurgency: The Threat of Afghan Opium. "The Afghan opiate trade fuels consumption and addiction in countries along drug trafficking routes before reaching the main consumer markets in Europe (estimated at 3.1 million heroin users), contributing to the spread of HIV/AIDS and other blood-borne diseases," the report said. Neighboring countries, especially Iran, Pakistan, and the Central Asian republics, are among the hardest hit, said UNODC. According to the report, Iran now has the highest opiate addiction rates in the world. "Iran faces the world's most serious opiate addiction problem, while injecting drug use in Central Asia is causing an HIV epidemic," UNODC said. But the impact of the multi-billion flow of Afghan opiates could have an especially deleterious impact on Central Asia, UNODC chief Antonio Maria Costa warned in remarks accompanying the report. "The Silk Route, turned into a heroin route, is carving out a path of death and violence through one of the world's most strategic yet volatile regions," Costa said. "The perfect storm of drugs, crime and insurgency that has swirled around the Afghanistan/Pakistan border for years is heading for Central Asia." In Pakistan and Afghanistan, the opium trade is funding violent radicals. "The funds generated from the drugs trade can pay for soldiers, weapons and protection, and are an important source of patronage," the report said. In Afghanistan, the Taliban generated between $90 million and $160 million annually in recent years, the UNODC estimated. In Pakistan, the UNODC estimated the trade at $1 billion annually, with "undetermined amounts going to insurgents." Although Afghan opium production declined slightly last year, the country is producing -- and has produced -- more opium than is needed to meet global demand. As a result, the UNODC estimates that there is an unaccounted for stockpile of 12,000 tons of opium -- enough to satisfy every junkie on the planet for the next three to four years. "Thus, even if opiate production in Afghanistan were to cease immediately, there would still be ample supply," the report said. Unsurprisingly, the UNODC report did not address the role that global drug prohibition plays in exacerbating problems related to opiate use and the opiate trade. Prohibitionist attitudes restrict the availability of harm reduction programs, such as needle exchanges, that could reduce the spread of blood-borne diseases. And it is global drug prohibition itself that creates the lucrative black market the UNODC says is financing insurgencies and spreading political instability. Southwest Asia: Afghan Opium Trade Wreaking Global Havoc, UNODC Warns The UN Office on Drugs and Crime (UNODC) warned Wednesday that the traffic in Afghan opiates is spreading drug use and addiction along smuggling routes, spreading diseases, and funding insurgencies. The warning came in a new report, Addiction, Crime, and Insurgency: The Threat of Afghan Opium. "The Afghan opiate trade fuels consumption and addiction in countries along drug trafficking routes before reaching the main consumer markets in Europe (estimated at 3.1 million heroin users), contributing to the spread of HIV/AIDS and other blood-borne diseases," the report said. Neighboring countries, especially Iran, Pakistan, and the Central Asian republics, are among the hardest hit, said UNODC. According to the report, Iran now has the highest opiate addiction rates in the world. "Iran faces the world's most serious opiate addiction problem, while injecting drug use in Central Asia is causing an HIV epidemic," UNODC said. But the impact of the multi-billion flow of Afghan opiates could have an especially deleterious impact on Central Asia, UNODC chief Antonio Maria Costa warned in remarks accompanying the report. "The Silk Route, turned into a heroin route, is carving out a path of death and violence through one of the world's most strategic yet volatile regions," Costa said. "The perfect storm of drugs, crime and insurgency that has swirled around the Afghanistan/Pakistan border for years is heading for Central Asia." In Pakistan and Afghanistan, the opium trade is funding violent radicals. "The funds generated from the drugs trade can pay for soldiers, weapons and protection, and are an important source of patronage," the report said. In Afghanistan, the Taliban generated between $90 million and $160 million annually in recent years, the UNODC estimated. In Pakistan, the UNODC estimated the trade at $1 billion annually, with "undetermined amounts going to insurgents." Although Afghan opium production declined slightly last year, the country is producing—and has produced—more opium needed than to meet global supply. As a result, the UNODC estimates that there is an unaccounted for stockpile of 12,000 tons of opium—enough to satisfy every junkie on the planet for the next three to four years. "Thus, even if opiate production in Afghanistan were to cease immediately, there would still be ample supply," the report said. Unsurprisingly, the UNODC report did not address the role that global drug prohibition plays in exacerbating problems related to opiate use and the opiate trade. Prohibitionist attitudes restrict the availability of harm reduction programs, such as needle exchanges, that could reduce the spread of blood-borne diseases. And it is global drug prohibition itself that creates the lucrative black market the UNODC says is financing insurgencies and spreading political instability. Three Colombian soldiers and two civilian members of a coca eradication squad were killed Monday when the boat in which they were riding came under rifle and grenade attack. Six more were wounded and six others were still missing Wednesday evening. The attack occurred in western Choco state, where leftist FARC guerrillas and rightist paramilitaries are both active. Early reports from the scene quoted witnesses blaming members of the FARC's 34th Front, with a local ombudsman telling Radio Caracol the group had been attacked on its way to eradicate coca fields. But another local official told the Associated Press that drug gangs and rightist paramilitaries also operate in the area. In the past three months, eradication teams have destroyed nearly half of the estimated 1,500 hectares of coca plants in the area. But as Monday's incident demonstrates, those efforts are not always appreciated. At least 26 of the 6,000 eradication workers employed by the Colombian government have been killed in the last three years. Manual eradication of coca is far outweighed by aerial eradication using herbicide. But despite spraying or uprooting hundreds of thousands of acres of coca plants each year, Colombia remains the world's largest coca and cocaine producer. According to the UN Office on Drugs and Crime 2009 World Drug Report, last year Colombia produced 81,000 hectares of coca, down from 2007's 99,000 hectares. Colombian coca production was at 80,000 hectares in 1997, then ballooned to 163,000 hectares in 2000, before declining and reaching an apparent plateau at around 80,000 hectares since mid-decade. The Obama administration has shifted gears in Afghanistan, rejecting the Bush administration's emphasis on opium poppy eradication in favor of attacking Taliban-linked drug trafficking networks as it increases the number of US military personnel in the country to nearly 70,000. Along with that increase in American servicemen and women in Afghanistan, the administration is also ramping up the DEA presence in the country. The number of DEA agents in the country will increase five-fold this year, according to a report in the Baltimore Sun. 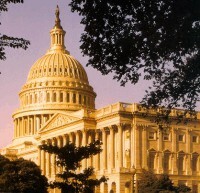 The agency currently has 13 agents in Afghanistan; that number will jump to 68 by September and 81 by 2010. An unspecified number of additional agents are also being sent to Pakistan, through which a large portion of the Afghan drug trade flows. 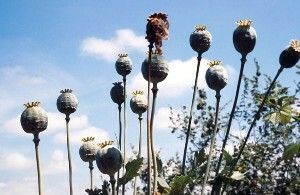 Afghanistan produces more than 90% of the world's opium poppy supply, from which heroin is derived. One province now in the sights of a 4,000 strong US Marine expeditionary force, Helmand province, by itself produces more than half of all Afghan opium and if it were its own country, would be the world's largest opium supplier. While all factions in Afghanistan have their fingers in the poppy pie, including numerous officials and warlords linked to the Karzai government, the US and NATO are especially interested in disrupting those portions of the drug trade that help finance the Taliban insurgency. The Taliban is estimated to make hundreds of millions of dollars a year from taxing poppy crops, acting as armed escorts for drug caravans, and running international drug trafficking operations. In the past, the Taliban has benefitted from eradication campaigns in at least two ways. First, to the extent such campaigns are successful, they drive up the price of opium, which the Taliban has abundantly stockpiled. Second, the eradication campaigns have proven a fertile recruiting tool for the Taliban as farmers angry at seeing their livelihoods destroyed look to join those who ostensibly oppose eradication. The Associated Press reported Wednesday that US and Colombian negotiators are nearing agreement on a plan to expand the US military presence in Colombia by allowing the US to base hundreds of Americans at a Colombian Air Force Base in the Magdalena River valley to support US anti-drug interdiction missions. A fifth and final round of talks later this month could seal the deal. The base would take up the drug war slack left by the ending of interdiction operations from the international airport at Manta, Ecuador, which is set for this week. The Manta base had been home for some 220 Americans supporting E-C AWACS and P-3 Orion surveillance planes scouring northern South America and the eastern Pacific for vessels and planes they suspect are carrying drugs. But Ecuadoran President Rafael Correa refused to renew the US lease, saying the US military mission there violated his country's sovereignty. Colombian officials told the AP the plan was to make Colombia a regional hub for Pentagon operations. The current draft of the plan, they said, would allow more frequent visits by US aircraft and warships to two naval bases and three air bases in Colombia, with the Palanquero air base being the centerpiece of the plan. 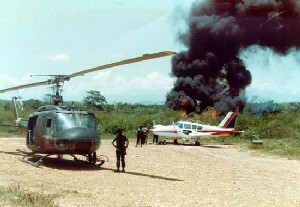 Palanquero had been off limits to US forces until April for human rights reasons -- a Colombian military helicopter operating from Palanquero had killed 17 civilians in 1998. But that's ancient history now. A bill already passed by the House and pending in the Senate would earmark $46 million for new construction at the base, which is home to the Colombian Air Force's main fighter wing. That funding would be released 15 days after an agreement is reached. Colombian President Alvaro Uribe is one of America's few remaining staunch allies in the region, and acceptance of the base deal could further stress already strained relations between Colombia and its more left-leaning neighbors Ecuador and Venezuela. 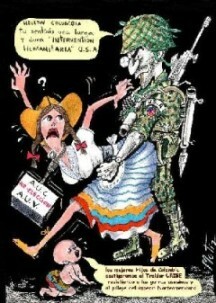 It's also certain to raise concerns about Latin Americans wary of US interventions in the region. Such concerns are not helped by Pentagon planning documents that suggest that beyond its anti-drug mission, Palanquero could be a "cooperative security location" from which "mobility operations could be executed." In other words, a jumping off point for US military expeditionary forces. The US has pumped several billion dollars of primarily military and police assistance into Colombia since Plan Colombia began in 1999. 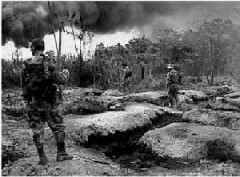 Originally defined as a purely anti-drug program, under the Bush administration, it took on the additional burden of counter-insurgency, defining the rebel FARC guerrillas as narco-terrorists who must be defeated. Despite all those billions of dollars in anti-drug aid, Colombia remains the world's largest coca and cocaine producer. Neighboring Peru is second, and Bolivia is third. Bolivia under President Evo Morales also forms part of the emerging left-leaning bloc in Latin America. Former Colombian defense minister Rafael Pardo, who is running for president in the May 2010 elections, told the AP that the radar and communications interception ability of US surveillance planes extends well beyond Colombia's borders and could cause problems with its neighbors. "If it's to launch surveillance flights over other nations then it seems to me that would be needless hostility by Colombia against its neighbors," Pardo said.